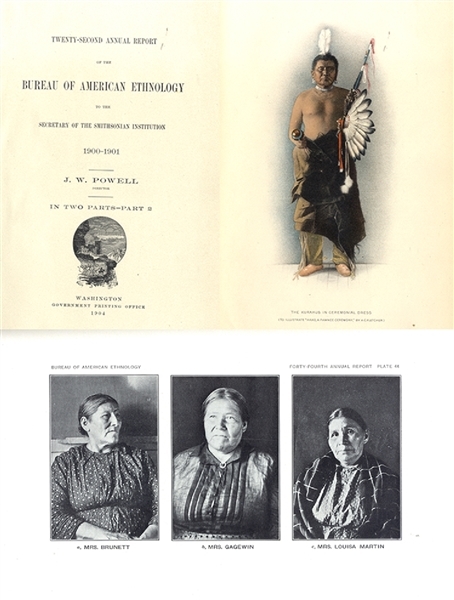 A Pair of Books, “Bureau of American Ethnology, to the Secretary of the Smithsoniam Institution, 1900-1901”, part 2 of 2, J.W. Powell Director, USGPO, 1904, 368pp., gilt Indian front board, VG. The volume is filled with illustrationsof the Indians’ tools, enviornments ... but most impressive are the six color plates present.... plus, “Bureau of American Ethnology, to the Secretary of the Smithsoniam Institution, 1926-1927” USGPO, 1928, gilt Indian front board, 540pp., VG. The volume is filled with illustrations and photographs of the Indians, their tools and their products.